Hair Bows, Clips, Headbands & More from $1.50 + Possible Free Shipping! 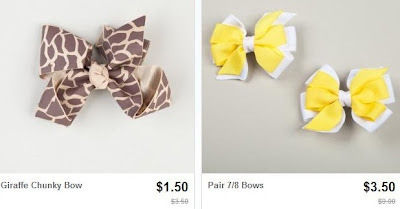 You can get adorable hair accessories for as low as $1.50 in Totsy's "Hair Bows Under $5" sale right now! There's lots of different styles and colors to choose from. You'll find clips, headbands and tons of bows! Even better, you'll get free shipping if this is your first order within 30 days of creating your Totsy account!